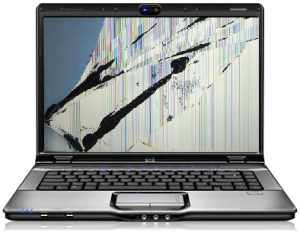 Have you accidentally dropped your laptop and broken the screen? Or even hit it in a fit of rage!? PC Wakeup can replace most makes and models of laptop screen for a fixed price of £99 (including the new panel). For this price we not only fit the screen but, unlike some of our competitors, we do a check on all critical hardware on the laptop to make sure that no other damage has been done. This ensures you're not paying out for a new screen only to find the hard drive has sustained damage. If we do find any further problems, we will contact you with a price and should you not want to go ahead, we will cancel the job with nothing to pay. As with all new hardware, the screen panel comes with a one year warranty as standard. The warranty does not cover accidental or deliberate damage to the new screen panel. If you do not want the screen fixed but just want your data (such as pictures, music, documents etc), then we can copy the data to another device for you. All prices include VAT. Some rare screens can be more expensive but we will always confirm the new price before going ahead.